Visions of Jesus Christ.com - Milton Jacobs, who nearly died during a 2007 police chase mentions his near-death experience in interview. Remembers "seeing bright light, I thought I was dreaming. I thought I was dead." Near fatal crash puts ex-Newark cop on new path. Remembers "seeing bright light, I thought I was dreaming. I thought I was dead." 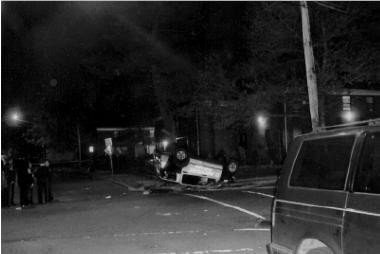 The scene of 2007 car wreck that ended Milton Jacobs career and nearly killed the 47-year-old Newark police lieutenant. Milton Jacobs, who nearly died during a 2007 police chase mentions his near-death experience in interview. Sunday, March 25, 2012 - Reported in [TheStar-Ledger]. Milton Jacobs, who nearly died during a 2007 police chase but came back to form a successful Newark security company called MJAKE. He talks about his experiences in a room he uses to train security guards. NEWARK — A near-death experience ended Milton Jacobs’ first career, but accidentally launched his second. On April 29, 2007, the veteran police lieutenant was responding to a shooting in Newark’s West Ward when he spotted the gunman’s car racing from the scene. Jacobs took off after the vehicle, engaging in a "cat-and-mouse" chase lasting several minutes. When the fleeing vehicle, heading toward Irvington, ran a red light, Jacobs continued his pursuit. He never saw the car that blind-sided his police truck. "I saw a bright light. And you know the old saying, when you’re about to go, you see a bright light," Jacobs said. "I thought I was dreaming. I thought I was dead." The 46-year-old man barely survived. Jacobs spent a year recovering from a laundry list of injuries — four broken ribs, temporary paralysis of his right shoulder, hearing loss in his right ear, and vision loss that lasted for weeks. The gunman was caught. But after 17 years and 11 months, Jacobs’ police career formally ended Aug. 1, 2008, and he had no idea what to do next. He spent 2008 in rehab, which Jacobs called "the worst year of my life." "I was going back and forth to the doctors, and the police department. Then I knew I wasn’t going to be able to go back to work," he said. "Two-thousand eight was just a year of depression." In a few years, Jacobs transformed from a hard-nosed cop into a businessman and a mentor to youth. In 2010, Jacobs’ fledgling company, MJAKE Security, won a contract to provide security during construction of the multimillion dollar ARC tunnel. His application had been boosted by a "disadvantaged" business classification he received because of injuries he suffered in the crash. He’s now teaching young Newark residents how to be security guards and how to tackle personal problems through MJAKE. "In a way, I feel like I’m more fulfilled doing this, as opposed to being a cop. As a cop you never get to talk one-on-one to the kids because we were so busy arresting them," Jacobs said. "We never really take the time to understand where these kids come from." Born in Newark as one of six children, Jacobs has spent nearly his entire life in service. He joined the Army after graduating from West Side High School in 1983, and spent four years at Fort Hood in Texas. Jacobs joined the Newark Police Department in 1989 and quickly climbed the ranks, becoming commander of the Vailsburg Task Force in 2004. In this position, he was awarded a departmental commendation when the unit’s area of responsibility in the West Ward experienced a 35 percent reduction in crime. It was one of 45 citations he received for notable police work in his career. 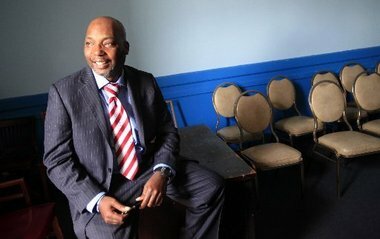 His dream was to be captain of the 4th Precinct and oversee police work in the West Ward, where he grew up. But, Jacobs said, that dream was "dashed" by the accident. Sick of sitting on a couch, and building on his police experience, Jacobs started MJAKE Security with the help of his friend Kareemah Majeedah, now the company’s vice president. While still a rookie in the business world, Jacobs quickly won a contract to handle security at the Pilgrim Village housing complexes in Newark, a client he still serves. "He gets the job done. He’s constantly talking to the tenants. He even takes the kids to the games at Bears stadium," said Woody Chance, one of the complex’s building managers. "If there’s a problem, they know they can always rely on him." Jacobs seized his most significant professional opportunity in 2010, when a friend set up a meeting with the project manager for Schiavone Construction, the company then building the ARC tunnel. The ARC, Access to the Region’s Core, was to have run from Secaucus to Manhattan, but was canceled by Gov. Chris Christie in October 2010. "She told me I had five minutes," Jacobs said of the meeting. Jacobs sealed the deal with his "ace in the hole" — the disadvantaged business license. In a weird way, Jacobs said, the car wreck helped solidify his second career. Jacobs’ former colleagues said they were impressed by his ability to rebound after nearly dying. "For him to come back the way he did is just remarkable. It showed a lot of self-perseverance," said Tyrone Browner, a retired police lieutenant. "He didn’t lose faith in himself." Jacobs now has two children, a 5-year-old daughter and a 19-year-old son, and is engaged to be married. For Jacobs, the best part of the job doesn’t involve security. He also teaches classes to young would-be security employees, having taught about 600 students so far. He coaches them on a range of topics including public safety procedures, voting registration, job hunting and how to handle issues at home or with their girlfriends. Jacobs often tells some of his rougher charges to "put down the guns and pull up the pants," referring to the sagging jeans sported on Newark’s street corners. "If you want to keep these kids off the corners, you’ve got to give them an opportunity," he said.